My husband and I have taken several vacations to Costa Rica. Before our first trip together, I'd been warned that Costa Rica 'was not known for its cuisine'. Simple meals, prepared with seasoning - such as rice and beans, chicken or fish - are common throughout the country. I figured I'd find it boring, but I was in for a huge surprise. The food was so fresh and flavorful everywhere we went. Seafood, fish, fruit, and vegetables...harvested at just the right time (quite possibly that same day). Pineapples were sweeter, juicier...better than anything I could buy at home in the US. 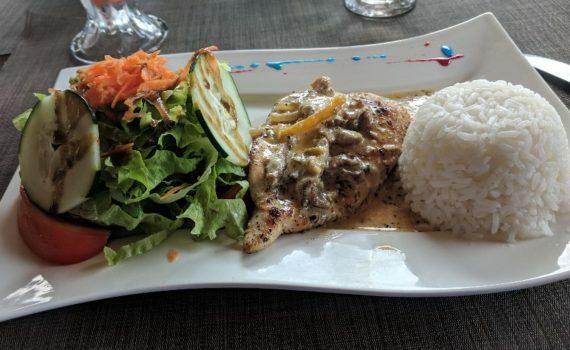 While there may not be much in the way of fancy Tico food, there are still a lot of restaurants in Costa Rica. Many restaurants are run by ex-pats who wanted to bring flavors of home with them. This makes it possible to sample menus from all over the world. And sample, we did... and developed a few favorites. We have many more places to try, so it's possible new favorites await us. Until then, here's our Top Five favorite Costa Rica restaurants. (I've noted price range by each name). My absolute favorite, Citrus is perfect for a romantic dinner or a get-together with friends. The open-air restaurant located in Ojochal is nestled in rain-forest and bathed in soft indoor and outdoor light. The ambiance is dreamy and inviting, and the menu boasts flavors from around the globe, served with a distinctly French flair. Citrus' offerings include several vegetarian, vegan, and gluten-free dishes, ranging from appetizers to desserts. Citrus is open for dinner and serves wine, beer, and spirits. I strongly recommend making reservations: the restaurant is popular with vacationers and ex-pats alike, and fills up quickly. Diqui's is a great casual restaurant situated on the edge of Palmar Norte, a short drive from Las Villas de San Buenas. The open-air restaurant is also a heladeria (ice cream parlor) and offers cones, smoothies, naturales, and frappés. Open for breakfast, lunch, and dinner, Diqui's menu includes both Tico and 'Western' favorites. Free wifi and friendly service. Fusion, located in Ojochal, just 5 minutes from Playa Ventanas, is a fantastic restaurant with an array of delicious offerings, including a full sushi menu. Decadent dishes like the Pollo Tropical pictured above boast unusual combinations of flavor that strike a savory balance. Here, strawberries are paired with basil pesto, wrapped in a seasoned chicken breast, and grilled to perfection. Served over a strawberry-balsamic reduction with salad and fried plantains. Fusion serves alcohol and is open for Lunch and Dinner; it's an excellent place for families and groups. Authentic, bold dishes are hallmarks of this unassuming roadside restaurant. Enjoy the relaxing, casual environment, generous portions, and friendly service. Terraba's moderately priced menu offers Tico and ex-pat favorites. Enjoy a casado for lunch, and pasta carbonara for dinner! Villa Leonor offers delicious, authentic cuisine in a fun, casual atmosphere. Access the beach just beyond the restaurant to catch a phenomenal sunset before dinner. Or enjoy a dip in the restaurant-adjacent pool, and swim up to the bar. The Sunday BBQ menu is especially delightful. If you dined at Leonor during the week, it's worth the additional trip. So flavorful! I recommend the Pollo (BBQ chicken) and the Pinchos Camarones (pictured above).